If you are looking for that quiet little family beach, then this is the place for you. 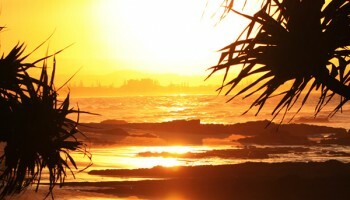 Budds Beach is centrally located, just off the Gold Coast Highway, Ferny Avenue. It’s so close to the action, yet far enough away that you can escape to what feels like a private little beach. It’s one of those local treasures, positioned on the Nerang River. One of the features that parents will love is that the playground is partially fenced off from River Drive. Being situated on the river, you can certainly try your luck at catching a whiting or flathead – there is a modern jetty with plenty of room to throw a line in the river. Plus, there is a bench seat if you want to just sit back and watch the water. At the northern end of River Drive, there is a boat ramp conveniently located for you to launch the family boat or jet ski so you can explore the canals or head out towards the Southport Seaway for deep sea fishing action. It really offers the best of both worlds – the beach, and the river. Because it’s a river beach, you won’t have to worry about little ones being caught in a rip or knocked over by bigger waves. Maybe if the kids aren’t quite ready to hit the water, they will love the playground with its slide, tubes, climbing steps and other modern equipment. Adjacent to the playground hub, there are also two swings for the children to enjoy. The playground area isn’t covered, but the trees do provide some natural shade. There are facilities, with toilets and showers so you can freshen up after your swim if you like. Also located in the amenities block is a water tap to fill up water bottles or wash sandy feet. Picnic tables are close by to the playground, with barbeque facilities as well. If you prefer, right across the road is a cafe where you can purchase drinks or lunch. 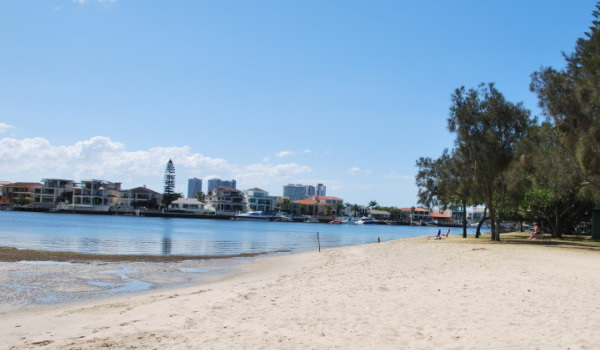 Whilst enjoying your barbecue or picnic lunch, you may be lucky enough to be treated to a water jet pack display – the latest and greatest craze to hit the Gold Coast! The action takes place right in front of Budds Beach. 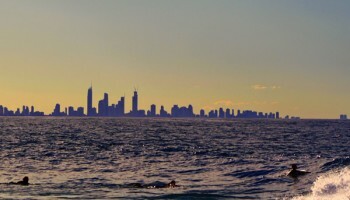 If you have never been to Budds Beach before, it’s easy to find. As you’re heading north through Surfers Paradise on Ferny Avenue/Gold Coast Highway, just take a left and you’ll find yourself on River Drive.